As we get older, household tasks we used to perform effortlessly become less enjoyable and more difficult. Mowing grass is something that many homeowning seniors enjoy but struggle to continue doing independently as they age. This is where smart technology can come in handy and help seniors live an easier life at home. Bringing in a robot to help with your yard work is convenient because it reduces the amount of strain and effort necessary to perform the tasks manually. Another plus is that it is often cheaper over the long-haul than hiring professional, live help. Let’s find out if the Worx Landroid is a useful product for seniors aging in place. If you are looking for a genius robot mower that manicures a perfect lawn like your private team of landscapers, perhaps you’re overshooting your expectations. However, if you are looking for a device that is simple to use and takes all the work out of mowing your grass, the Worx Landroid might be perfect for you. You have had it with mowing the lawn. Either the task has become too physically demanding, or you’ve decided it’s time to hand off the duties to someone (or something) else. Maybe you have considered hiring someone, finding a neighbor kid, or asking for help from a family member but you need to get the grass cut. The Worx Landroid has a lot of benefits that make your life easier, such as self-mowing and easy setup. However, there is the drawback of the Landroid missing low objects like rocks and damaging easily due to the structure of the blades, but as long as you prepare your yard ahead of time, the Landroid should not hit any obstructions. Let’s start by talking about how the Landroid looks and how effective it is at mowing your lawn. Weighing in at about 36 pounds, it is light enough to glide nicely across your grass without much issue. While it cannot cut grass during the rain, it is entirely capable of use after a heavy downpour because it does not get stuck or bogged down in the mud and wet grass. The dimensions are 22 x 15 x 9.5, so it is small enough to fit into narrow areas that you may not be able to get with a large riding mower but of course, there is the question of accuracy when it is in those tight areas, but we will get to that. One of the great things about the functionality of this mower and something we were concerned about was whether or not it could cut on a steep hill. The Landroid was put to the test and is capable of pushing up and down on a 20-degree incline which should work for most yards. If you look at the Landroid from a distance, the biggest thing you will notice is the large stop button followed by a waterproof enclosure which houses all of the controls. Inside the cover is the start button, power, charging area, keypad, and other controls. There is also a small LCD screen that alerts you to how much charge is remaining and how your mower performs during its job. The Landroid is simple for seniors to use because all of the buttons have clear print on them and the control area is straight-forward. Everything has a direct purpose and function, which makes the technology simple for seniors and caregivers to understand. If you attempt to pick up the mower while it is in the middle of a mow, it will automatically power off. This feature is designed with safety in mind to prevent being exposed to the blades. One thing we noticed is the delicacy of the blades, which was a slight concern. The blades on most mowers are thick and durable but the blades on the Worx Landroid are barely 18 centimeters thick, and while they look nice and sharp, they also seem fragile. If you have a nicely manicured lawn with few obstacles, this robot will work correctly for you. If your yard has a lot of holes and rocks, you want to take extra care when setting this up. Similar to other self-performing robots this mower comes with a docking station where it goes when it is low on battery. The station does not stick out and is not overly large, so it won’t occupy much storage space. Charging the Worx Landroid was not an issue for us. It never ran out of charge, and it never had a hard time finding the docking station. This feature is a considerable improvement from a lot of other self-performing robots we have tested such as the Roomba. This robot finds the station every time and never gets stranded in the yard. The Worx Landroid is incredibly simple to set up, but it does require a bit of physical work, which could require assistance for some seniors. The mower requires you to run a detection cord around the entire perimeter of your lawn. The wire acts as your boundary, so the Landroid knows where the edge of the yard is. This job is not a big deal for some people, but it may not be feasible for everyone. The company recommends burying the cord underneath the ground to prevent accidental slicing of it, but you could peg it into the ground well enough so the mower can’t reach it. It is critical to figure out your boundary in a way that includes the docking station as well. This is a mistake we made; as we forgot to put the docking station in the boundary area and could not figure out why it wasn’t making its way back to the dock on its own. The max cutting area is a ¼ acre, so that is how much cord the mower provides. Another critical thing to remember is the mower runs along the wire so if you place it up against a fence or sidewalk it will bang into it and it does not bounce off and head in a different direction like a Roomba would. The Worx Landroid will not recognize obstacles that are along the wire, so you need to give it a little space from fences, sidewalks and landscaping. A drawback like this could require you to go through with a weed-wacker or push mower and finish the job manually. There is an area underneath the docking station that the wire has to run through for it to work correctly. Make sure you set up the perimeter wire first before you secure the docking station or else you will have to dig it up and start again. All the facts and figures are significant, but you want to know how this mower works and whether it’s worth the investment. The answer is yes. You can set it to cut the grass between 1.6 inches and 4 inches depending on what you desire. Worx recommends letting the mower gradually work its way down on its own. The mower follows no exact pattern and sort of has a mind of its own. There is also no convenient way to collect the grass clippings, so if your grass is high, you’ll run into the issue of excess clippings strewn across the yard. When it comes to avoiding obstacles, the Landroid does an excellent job of dodging obvious things like shrubs, trees, and tall landscaping. The little things that barely poke out of the grass like rocks or small stumps are another issue. There is no way to get the Landroid to avoid these objects unless you put something more substantial over them and this requires additional work for you. If there is anything left in the grass such as garbage or an object such as a sock (this happened to us), it will chop it up or fling it out. The Landroid isn’t perfect, but few robots are. With the goal being to provide seniors a more hands-free way of maintaining their property, this unit performs admirably. One of our qualms is the fact that the mower cannot get close enough to anything to get a perfect cut. For trees and other landscaping that are within the boundary, the Landroid will not get up against it due to its design. 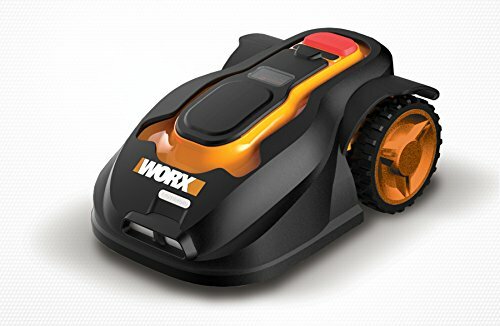 Perhaps with more of a round oscillator design, it would be able to coast along landscaping and areas like that for a better cut, but unfortunately, the Worx Landroid does not boast this capability. Lastly, if you have an irregular yard with small spaces opening up into larger spaces the mower has a hard time detecting those areas even if they are within the boundary. It has no real direction or path so if there is a tight space for it to fit into the mower will most likely miss that area entirely and focus on the large open space requiring you to pull out the mower and do it yourself anyway. If you are like most people you have a front and back lawn and you would expect the Worx Landroid to handle both. For example, if you have a fenced in backyard with a gate that opens up to your front yard, your goal would be to lay the perimeter wire around in a way that moves the Landroid through the gate when it is time to switch yards. Since there is no directional requirement for the mower, it would most likely get stuck in one side or the other. You’re probably concerned about someone potentially picking the mower up and stealing it. Luckily, the Landroid has a built-in security system that lets out a loud shrieking noise if the mower gets raised without you entering the security pin first. This feature works well, and it the alarm reliably sounds each time you try to lift the mower. There is one design flaw here. Let’s go back to our example of the front and backyard. If your mower gets stuck in the yard that does not have the docking station, the battery will most likely die, and the mower will remain stuck in that yard. If the battery is dead, the alarm will not sound, and your mower can be taken without alerting you. If theft is a concern for you, be sure to set up your perimeter in a way that guarantees the mower does not die or get stolen. The Worx Landroid is an improvement from previous products and if you have a yard that is simplistic with little obstacles than this robot should work with no issue for you. If your yard has a lot of small spaces; dips, and ailments than you want to be extra careful with the Landroid. The main thing to think about is whether or not the Worx Landroid helps take the job of mowing grass out of the hands of seniors and it does. With the exception of major bumps and dips in its path, the mower does an excellent job on the grass while you sit back and let it go.